A new report from the Norwegian news site AfterPosten claims that Lucasfilm has been scouting Pulpit Rock in Norway for scenes in an upcoming Star Wars film. This comes from Per-Henry Borch and Tor Arne Øvrebø of the Icelandic Production company, which has previously worked for Lucasfilm on The Force Awakens. Borch claims that he toured Lucasfilm crew members around several Norwegian locations in June and July. They were apparently looking for locations similar to Pulpit Rock in case they were not able to film there. It seems unlikely that this for either Rogue One or Episode VIII, given that both have wrapped filming (though it could be for Episode VIII reshoots). It seems more likely that this is for the upcoming Han Solo A Star Wars Story film or Episode IX. 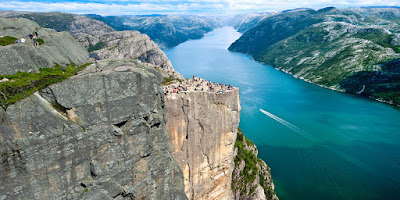 AfterPosten also reports that Marvel Studios is interested in filming scenes from a future film at Pulpit Rock. This new era of Star Wars films has seen crew travel to all sorts of cool locations to capture scenes from the galaxy far, far away. Location filming for The Force Awakens took place in Abu Dhabi, as well as England and Ireland. Rogue One filmed scenes in Jordan, Maldives, and Iceland. And Episode VIII shot scenes in Ireland and Croatia. Gotta see Luke having his "final" duel on that. He doesn't have to die, but it definitely needs to be his final fight.